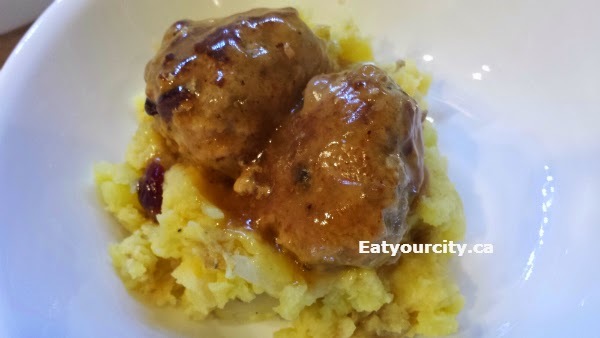 Eat Your City: Turkey and pork cranberry meatballs recipe - taste of turkey dinner in one bite! 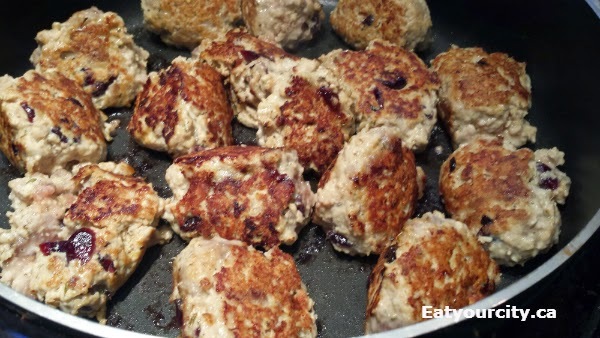 Turkey and pork cranberry meatballs recipe - taste of turkey dinner in one bite! Posted by I was craving turkey dinner. The full on turkey with cranberry sauce and gravy and mashed potatoes and... it was nowhere near Thanksgiving nor Christmas nor Easter (okay, its Easter now by the time I posted this lol! ), so ack when then, I wasn't going to be able to get my hands on a whole turkey easily. But you can usually get fresh ground turkey year round. 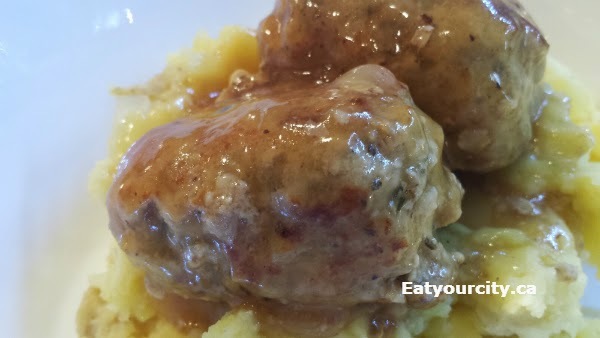 Then it hit me.. why not try making meatballs that incorporate the taste of a turkey dinner in one bite? And so, my turkey dinner meatballs recipe was born! 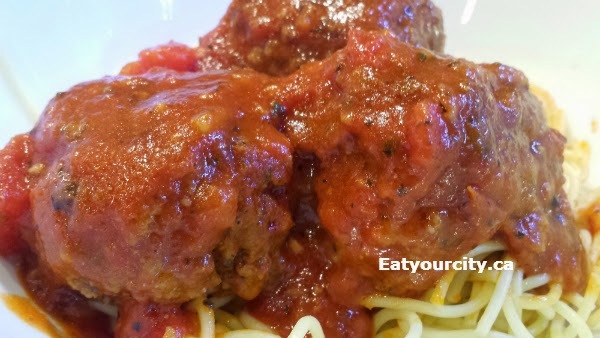 I use a mixture of ground turkey and pork as I personally find using 100% ground turkey makes for well.. drier meatballs as the meat is naturally just so lean. I like using a 50-50 or 75-25 mixture of ground turkey to pork for a good balance of flavor to moistness ratio. I've even tried using pork sausage instead of ground pork, but I find it changes up the flavor a bit too much. They will be on the soft side when you put them in the pan, and searing them will firm them up and give them flavor. You can leave the dried cranberries whole, but giving them a rough chop gives smaller sweet-tart elements in your finished meatball vs biting into a big hit of cranberry. On and yes, DO use roasted chicken or turkey stock if you have it on hand.. it totally makes the gravy out of this world. 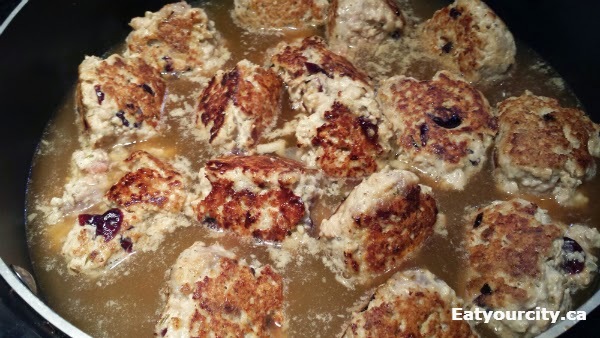 1) In a large mixing bowl, combine everything but the ground meat, oil, cornstarch and broth. Let sit for 10-15 minutes so the oatmeal has a chance to rehydrate. 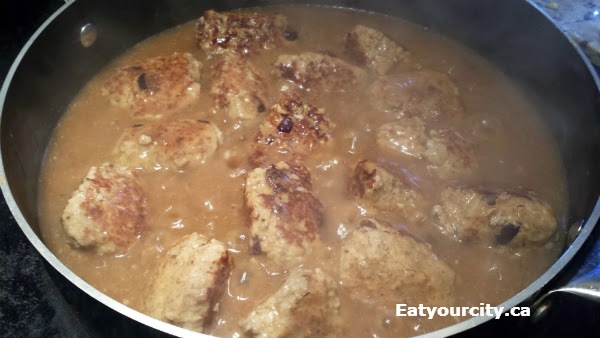 2) Mix in ground turkey and pork. Form into 16-20 meatballs, just slightly smaller than a tennis ball - the smaller the meatballs, the faster they will cook. 3) Heat up a large deep non-stick frying pan on medium low and add in oil. Place in meatballs, being careful not to crowd them. Sear gently, roll the meatballs around so they sear more of less evenly - this will take a few minutes. 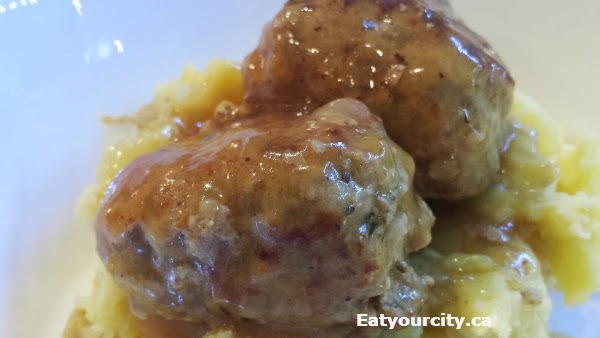 4) Once all meatballs are seared, dump in the broth (saving 1/2 a cup of the broth), bring to a simmer and cook, rolling the meatballs occasionally for another 10 minutes.